One of the most visible ways we ensure every life is well remembered is through our tribute services. We feel so strongly about creating lasting personalized memories that we have a dedicated Tribute department who will create video and print keepsakes to preserve your loved one's unique personality for generations to come. Once you provide pictures of your loved one, either digitally or as print photos, our video technician will help bring your loved one’s story to life. A tribute video can be shown at the service of your choice: visitation, church service, tribute luncheon or repast, or it can be kept as a keepsake and copies can be given to family and friends. 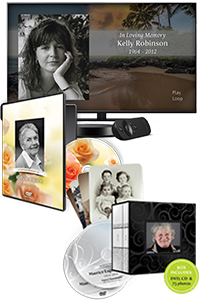 Our state-of-the-art audio-visual system at each funeral home will showcase your loved one’s story in the most modern, high-definition style possible. What’s more, all tribute videos created by Bradley are posted to your loved one’s online obituary page, where they will remain indefinitely and where additional copies and keepsakes may be ordered directly at any time. You may review the many background theme and stock music options here, but also recognize that we are able to completely customize the look and soundtrack for any video. Please ask your funeral professional for details. *Items will be shipped to funeral home and usually arrive within two weeks. We offer a selection of print mementos from Messenger Fine Funeral Stationery including prayer cards, register books, service folders, and grave markers. 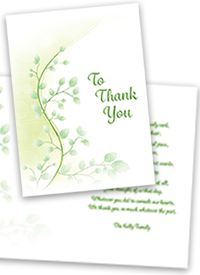 In addition, Bradley Funeral Homes has a graphic designer on staff who will custom design prayer cards, bookmarks or other print tribute items to your specifications. Bradley Funeral Homes has a graphic designer on staff who will custom design prayer cards, bookmarks or other print tribute items to your specifications. All prices include 10 laminated cards. Extra lamination is available at $1 per card. 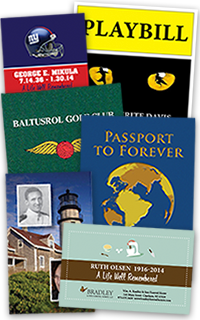 Ask your funeral professional about custom bookmarks, posters, or other print tributes. 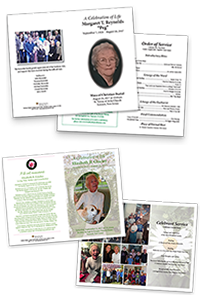 Our Tribute Programs are co-created with you by our tribute creative services manager and serve not only as a personalized record of a life well remembered, but as a keepsake for years to come. They may be used as both a supplement to, or in lieu of, a traditional Order of Service provided by a church. Our families find tremendous value in this unforgettable service. 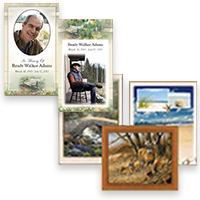 Bradley's Tribute Department also offers personalized acknowledgement (thank you) cards in addition to photo display posters. Furthermore, our graphic designer can work with you to develop any custom print keepsakes. Simply bring us your ideas, and we'll create the memories for you. Custom posters may also be created using a variety of photos/images. Please ask your funeral professional for details.